Men spill out from a mosque in the streets of Rabat, Morocco during Friday prayer. The U.S. State Department’s official assessment of current conditions in the Kingdom of Morocco. The current assessment of Morocco’s geography, economy, politics and culture from the U.S. Central Intelligence Agency. Features video segments about Islam from the award-winning PBS series RELIGION & ETHICS NEWSWEEKLY, lesson plans and other educational resources for students in grades 4-8. FRONTLINE examines Islam’s worldwide resurgence thorugh the stories of diverse Muslims struggling to define the role of Islam in their lives and societies. Web site for the PBS special which explored more than a thousand years of Muslim history and culture. 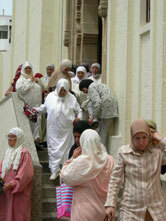 Women outside the door of the women’s section of a mosque in Rabat, Morocco after Friday prayer. LexicOrient is an interactive enclyclopedia of people, places and concepts pertaining to North Africa and the Middle East. The mission of the Arab World Institute museum in France is to present Arab-Islamic civilization from its origins through the present day. A Web site dedicated to understanding Islam. The Global Fund for Women, a grantmaking foundation, supports organizations which promote educational access and economic independence for women and which combat violence against women around the world. The Association for Women’s Rights in Development is an International membership organization working to connect, inform and mobilize people and organizations committed to achieving women’s rights. A Web site on religion. This site offers an introduction to Islam and explains some of its key aspects. 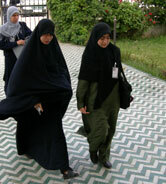 Murshidat, or female religious leaders, enter school. The Web site of Nadia Yassine, daughter of the founder of the Moroccan movement AL ADL WAL IHSSAN (Justice and Charity Association). Currently facing prosecution for statements she made in 2005 denouncing the monarchy, Ms. Yassine is a lecturer and author of numerous articles about women in Islam, the Moroccan Family Code, Palestinian issues, Iraq, human rights, and the government of Morocco. Data: Timeline of some prominent women in the Muslim world. Produced by © 2019 WNET.ORG Properties LLC. All rights reserved. Produced by THIRTEEN ©2019 WNET.ORG Properties LLC. All rights reserved.